During the 1990s the involvement of veterinary students in rabies prevention and control activities in Lusaka, Zambia, had very positive outcomes. A large-scale two day rabies vaccination campaign was conducted during a week-end in the poorest areas of Lusaka, resulting in the vaccination of >9,000 dogs (and some cats). As preliminary dog-ecology surveys had shown that mostly children, especially young boys, were responsible for dogs within households, vaccination programmes were preceded by an intensive 2 week awareness campaign, targeting schools and children. Last year students of the Veterinary Faculty of Lusaka were closely involved in the organisation of the vaccination campaigns, so to gain experience in the planning and design of this type of activities. They also participated in elaborating messages in different local languages and in disseminating them through radio and television. Very limited resources were available for the campaigns and the Lusaka Rotary Club provided field teams with transport, lunch and a barbeque after the campaign to thank all the volunteers for their participation. A total of 30 vaccination teams composed of veterinary students from different years together with a qualified veterinarian were taken to one location in the morning and another one in the afternoon. Vaccination points were mostly placed in schools, because their location is generally well known to local people and due to availability of tables, chairs and toilet facilities. The only disadvantage of using schools is that dogs tend to soil the premises, which need thorough cleaning after the campaigns. The weekend had been chosen to enable school children to bring their animals as previous campaigns during the week had resulted in insufficient vaccination coverage. 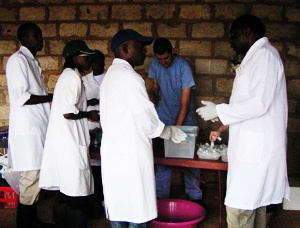 Overall the involvement of students in rabies campaigns was perceived as a very useful and successful hands-on experience. Photos courtesy of the Lusaka Animal Welfare Society and University of Lusaka Veterinary Department.